Thought this was kind of amusing, kind of sad, and kind of good news all in one, so I figured I'd post. An anonymous donor has given $ 5 million to keep Fermilab (Fermi National Accelerator Laboratory) in operation. 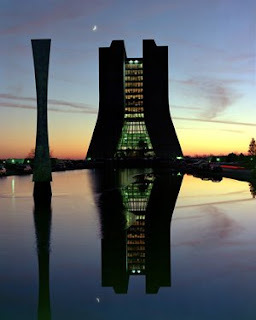 Located in Batavia Illinois, Fermilab is the only particle physics laboratory left in the United States. As a government agency, the lab can't directly accept the gift, but the money will be filtered through the University of Chicago, who will then contract the lab to do more work. Bailing out national physics labs is apparently not a new phemenonon. Back in 2006 Brookhaven National Laboratory in Upton, New York received $13 million from a billionaire to continue running its Relativistic Heavy Ion Collider. In any case, the money will allow Fermilab to stop the temporary layoffs and unpaid leave employees have been experiencing, although 140 layoffs are still planned. The money issues surfaced when Congress cut Fermilab's 2008 budget from $ 372 million to 320 million last December. The generous donation will allow the particle smashing Tevatron Collider to continue searching for the Higgs Boson, without laying off employees. Fermilab is part of an unofficial race with CERN, the European particle physics laboratory in Geneva Switzerland, to see who can find the Higgs Boson first.